When is changing your mind considered being flexible? When is it considered breaking a promise? As a candidate, Hawaii Governor Neil Abercrombie promised not to raise the General Excise Tax (GET) – a tax levied on wholesale, manufacturing, and retail goods, including food and medicine. It’s an unfair, pyramiding tax that forces us to pay taxes on the taxes we pay – but that’s another issue. By March 9, 2011, Abercrombie decided that “We’ll just see what transpires.” His spokesman explained, “If a measure to raise the GET passes out of the Legislature because other elements of his plan are not adopted, he will of course consider it as the people’s will.” A week later, on March 16, 2011, Abercrombie admitted that he is “flexible” about raising the GET. His staff clarified, “Raising the rate of the general excise tax is not currently being considered” (emphasis added). Perhaps succumbing to public criticism, on March 30, 2011 Abercrombie stated that he does not support a GE tax increase, and that we can balance the budget “All without doing the GET.” He said that a GET increase is a bad idea financially and politically – “It won’t wash with people,” he admitted. I hesitated to write this, because Better Hawaii is focused on challenging people to find solutions, not complain about problems. But in the end, I think that it’s important and worthwhile to discuss when it’s okay to change your mind. I think it depends on whether there is new information or revised circumstances. So what made Abercrombie re-think his stance on raising the GET? How much new information was available? We don’t know what new information Abercrombie received as governor; we only know the information released the previous governor. But we already knew about the falling tax collections (for some reason, the government calls this “revenue”), the rising costs of sewer and road repairs, and the problem of unfunded pensions. How has the situation (the economy) changed? Abercrombie could not have predicted the Japan earthquake and tsunami in March that has led to declining tourism, business slow-downs (for example, the Kona Village Resort has closed indefinitely), and costly repairs. But certainly, Abercrombie knew that we still have higher-than-normal unemployment, lower salaries, furloughs, and a Honolulu rail system that is on track to cost billions of dollars. On this issue, raising the GET to pay for government, is Abercrombie justified in changing his mind? Do you support or oppose his “flexible” thinking? Should he have changed his mind a second time, back to his original stance? “Cutbacks cripple many government functions,” an April 17, 2011 Honolulu Star-Advertiser headline screamed. The article highlighted some of the cuts that have been made in government services. Instead of complaining about these cut-backs, let’s consider whether we can change the way we get things done – and change our expectations for the services that government provides. I’ll get us started with three departments, and a few ideas. * Hawaii Department of Education: Some schools have been closed; the number of school days has been reduced; funding has been cut for part-time teachers, tutors, and textbooks; bus fares and school meals have been increased. Suggestion #1: Charge tuition for public schools to help pay for teachers’ salaries and supplies – no waivers or credits. Public education is not free – our Constitution only guarantees us the right to equal access to public education. If each student pays $100 a year (that’s $10 a month), we could recover over $17 million for public schools (there were 178,649 public and charter school students enrolled during the 2009-2010 school year). It’s not unreasonable – in 1933, students paid $10 ($164.80 in 2010 dollars) to pay teachers’ salaries (from “Hawaii’s Forgotten History” by Rich Budnick). Suggestion #2: Create programs for parent-run after-school programs and tutoring. It’s not government’s job to provide childcare, even at $80 a month, so let’s get parents back in the game. If 20 children need a safe, fun place after school, then each parent would have to volunteer just one or two afternoons a month to supervise the children – in a school classroom, park recreation area, or library. Youth sport teams are run by parent coaches and volunteers – why not after-school care and tutoring? * Hawaii Department of Taxation: Positions have been cut, resulting in delays in processing tax returns and responding to taxpayer issues. Suggestion #1: Online tax payments should be free. We should encourage people to file and pay their tax returns online, reducing the need for staffed offices and ensuring that tax payments are processed quickly. Instead, we penalize online payers with a $1.00 fee for eChecks and a $1.00 fee plus 2.25% for credit card payments. The Business Registration Division offers a discount for online registration; why not the Department of Taxation? Suggestion #2: Create fewer and simplified tax forms. Do you realize that there are over 50 forms and schedules for individuals, over 25 for partnerships, over 40 for corporations, and over 35 for S-corporations? That’s just for income taxes. Why can’t we have three tax returns – for individuals, for-profit businesses, and non-profit businesses? Why do we need so many schedules, worksheets, and forms? Maybe if we had fewer forms and schedules, it would save everyone time, paperwork, and frustration. We would be able to process tax returns on time and fewer people would need taxpayer assistance. * Hawaii Department of Agriculture: There are fewer inspectors; no inspections on some produce; and delays in inspections. Suggestion #1: Let each local grower or distributor certify its own products, including coffee. Government inspections add costs, create delays to market, and give consumers a false sense of security and product endorsement. Instead, each company could certify that they have inspected their products, and include the date, time, and initials of the examiner. Remember Inspector 12 from the 1980s Fruit of the Loom commercials? There is already a Seals of Quality program – why can’t it be expanded for imported products too? With enough training, maybe grocery stores could inspect produce at the docks, instead of when good are delivered. I know that food safety and pest control are important and complicated issues, but let’s think about alternative solutions to government inspections. Suggestion #2: Reassign the 18 coqui frog agents to produce inspection. Food safety is more important than public nuisance control. Government has taken on many roles in our lives. What do we really need government to do, and what can government do really well? What government services are really our responsibility as individuals, employees, and business owners? Great news! President Barack Obama is expected to sign into law the Small Business Paperwork Mandate Elimination Act of 2011. Passed by both the House and Senate, this law will repeal a small and costly provision buried in the 2010 Patient Protection and Affordable Care Act that would have required businesses to report payments of $600 or more for all vendors (not just independent contractors) to the IRS. If that provision were allowed to stand, businesses that bought more than $600 in office supplies from Office Depot, or more than $600 in groceries from Costco, or more than $600 in telephone services from HawaiianTel, would need to file Form 1099s for each vendor. This would have driven up the cost of record-keeping and generated a ton of useless paperwork. How did our Hawaii Congressmembers vote? Remember how our Congressmembers voted on Election Day. Taxes and more government spending aren’t the answer to our economic crisis. They may help some people, but only by taking away from others. 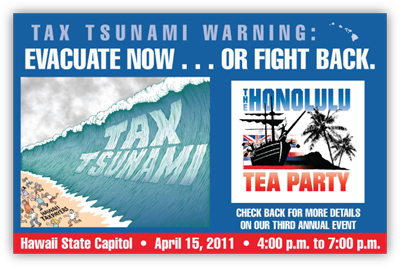 Tomorrow on April 15, 2011 the third Honolulu Tax Day Tea Party rally will be held at the Hawaii State Capitol Building from 4-7 pm. On Maui, the second Maui TEA “Taxed Enough Already” Party event will be held at Hoaloha Park in Kahului from 2-6 pm. On the Big Island, the Kona Tax Day Rally will be held on Queen’s Highway by the Kona Hawaii Temple from 4-6 pm; and the Hilo Tax Day Tea Party will be held at the Hilo Bayfront King Kamehameha Statue from 4-6 pm. Please join Hawaii taxpayers to show your support for fiscal responsibility. It is with some irony that I write, Congratulations! On April 6, we celebrated Tax Freedom Day, the day that Hawaii taxpayers have earned enough money to pay for this year’s federal, state, and local taxes. The Tax Foundation (www.taxfoundation.org) calculates this date every year using government data on income and taxes, not including the deficit. According to the Tax Foundation, there are five major tax categories: individual income taxes, payroll taxes, sales and excise taxes, corporate income taxes, and property taxes. We each have work for 96 days just to run our government, but today we are working for ourselves – 6 days earlier than the national Tax Freedom Day on April 12. Now for the bad news: get out your wallet – by April 15, we have to pay taxes for 2010. Something to remember: freedom isn’t free, but don’t allow our legislators to price us out of the market! 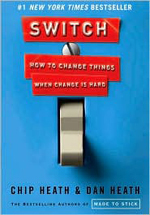 Last week, I reviewed the book “Switch: How to Change Things When Change is Hard” (2010) by Chip Heath and Dan Heath. It all comes down to the idea that “Big changes can start with very small steps. Small changes tend to snowball” (page 255). I want to highlight three of the education “switches” mentioned in the book. In these examples, teachers and students achieved big improvements from small attitude changes. * Two grades ahead: First grade teacher Crystal Jones was dismayed by the skills gap among her students at an Atlanta, Georgia elementary school. Some students had never been to school, and they were all on different levels. But she boldly challenged her students: by the end of the school year, you’re going to be third graders! She gave them an ambitious goal that appealed to their emotions. She created a culture of learning in her classroom, called her students “scholars,” and encouraged them to share what they learned with their families. By the end of the school year, over 90% of the kids were reading at or above a third grade level. * The brain is like a muscle: In 2007, three college psychology professors, Carol Dweck, Kali Trzesniewsi, and Lisa Blackwell taught a group of seventh grade math students a new way of thinking. For just two hours over eight weeks, students were taught a growth mindset: that the brain is like a muscle, it can be developed with exercise, and working hard can make you smarter. While the grades of students who were taught generic study skills declined slightly, the grades of “brain is like a muscle” students actually improved over the school year. * A new grading system: At Jefferson County High School in Louisville, Georgia, 80% of the students lived in poverty and only 15% went on to college. New principal Molly Howard wanted to make a change, starting with a new school identity: all students were college-bound. She increased assessments and tutorial programs, and created a new grading system: A, B, C, and NY (Not Yet). Students and teachers were motivated, test scores went up, and the graduation rate increased. Would any of these small changes work in Hawaii’s public schools? Do you know teachers who have helped their students make great achievements? Change is hard, but big changes can happen. “Switch: How to Change Things When Change is Hard” (2010) by Chip Heath and Dan Heath shows us how we can make changes in our lives by outsmarting ourselves. The central idea is that “Big changes can start with very small steps. Small changes tend to snowball,” (page 255). Practical, attention-grabbing, and interesting, the book is filled with studies, real-world examples, and practice clinics. “Switch” builds on Jonathan Haidt’s “The Happiness Hypothesis,” which says that our emotional side of our mind is the Elephant and our rational side is its Rider. The Elephant has energy, but needs motivation; the Rider is a visionary, but needs direction. And we can increase the odds of a successful change by changing our environment – the places where we work, the order we do things, even the people around us. 1. Direct the Rider: Our rational side is often overwhelmed by details and possibilities. So we need to find the bright spots – the things that are already working; create a plan so we don’t have to make small decisions; and have a specific, worthwhile goal. For example: to exercise more, we could start by thinking of all the ways we already exercise, no matter how small, and find ways to do a little more – park a little further from the front door, use the stairs instead of the elevator. 2. Motivate the Elephant: Our Rider may want to change, but our Elephant needs convincing. We need to connect to a feeling – such as showing the problem in a way that we can see or touch; break down a big change into smaller steps; and create an identity so that the people around you support the change. For example: to become debt-free, we might start by paying off the smallest debts first, regardless of the interest rates – because it gives our Elephants an easy victory that helps us keep the change going. 3. Shape the Path: Our environment can shape our behavior, but we can shape our environment to change our behavior. We can tweak things, like rearranging a room or simplifying a form; we can build habits, like setting “action triggers” and using checklists; and we can rally the herd, by bringing hanging out with people who want to change. For example: to work more efficiently, we might turn off the ‘new email’ alerts or work on a computer without Internet access at all; and have meetings in which everyone is required to stand up, relying on the group’s body language to signal when someone is getting off-topic. There’s more information and advice at their website, www.switchthebook.com/resources. You are currently browsing the Better Hawaii weblog archives for April 2011.